Never underestimate your small yard. Sure, you may find it challenging to put on your listing, but that doesn’t mean it can’t be an interesting focal point. As yards become scarce in the market, highlighting your small yard is not a bad idea. The following are three rules we adhere to in elevating homes with small yard spaces. Purchase plants that can grow vertically instead of horizontally. You might also want to add some wall planters and decorate with eye-catching ornaments, grasses, and plants. And when you need more room, you can play with raised beds and add retaining walls. Plants add personality to every yard and it doesn’t matter if it’s small, you can always create inviting spaces that will drive prospects to putting an offer. Even if your yard is small, make sure there’s a sense of function there. Add some comfortable patio chairs, or you have had a little meditation zone with yoga mats. Get your buyers to look across your yard. As you do that, you’re creating an effect that makes the space feel larger than it really is. For example, add a bench at the end of the yard with surrounding landscape and luscious plants. When it comes to selling your house, you never want to underestimate every room. Add personality to them that can truly speak to the most buyers. 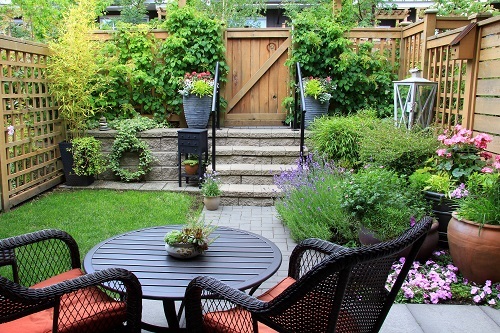 And when it comes to a small yard, you can never go wrong with plants and functionality.